Belgium midfielder Eden Hazard has signed a new five-and-a-half-year deal with Premier League leaders Chelsea. The 24-year-old, signed for a reported £32m from Lille in 2012, has scored 13 times in 36 appearances this season. "Since I came here in 2012, I have always felt good and the club has been very supportive to me," Hazard said. 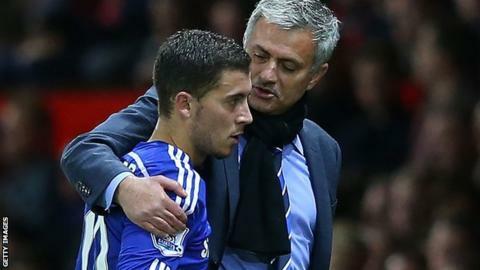 "He is already a top player and his evolution has been fantastic," manager Jose Mourinho said. "He is still very young and he can become the best." Hazard, who helped Belgium reach the World Cup quarter-finals last year, has made a total 147 appearances for the Blues, scoring 43 goals. "The manager has helped me improve a lot, the fans have been fantastic and I have an amazing understanding with my team-mates," he added. "I always try to give pleasure to the supporters with my style of play and it is nice to know they appreciate my work."